Yet another cruel blow for Albania who were undone by France so late in the second half when Griezmann came on as sub to score the winner in 90th minute. It was more of a de ja vo similar to first game as Payet scored after a great counter attacking move to make it 2-0 and seal second straight late win for the hosts. French coach Didier Deschamps dropped Pogba and Griezmann from the starting lineup which raised a few eyebrows while Martial and Coman started the game who struggled to impose themselves on the game in opening 45 minutes. Not many gave Albania a chance to with stand France quality but they held their own and actually hit the woodwork when the game was still at 0-0. France started the second half stronger and both Pogba and Griezmann were introduce to inject more quality and it proved to be the difference when Griezmann scored with a header late in second half to win the game. 90′ 1 – 0 Antoine Griezmann header sealed important three points for France who will be relieved to get away with three points and qualify for knockout stages. 90′ 2 – 0 Dimitri Payet made it 2-0 and put the seal on France qualification to next round on a counter attacking move. Team News & lineups: France are likely to keep the starting lineup from first game only Moussa Sissoko is someone who might be consider Team News to put more depth in midfield. 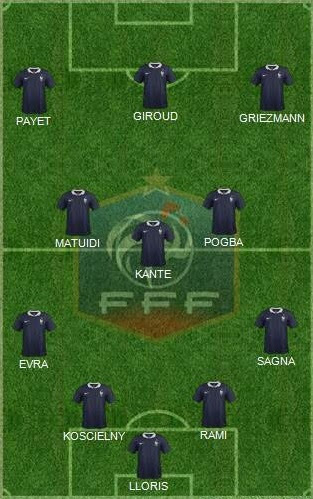 A traditional 4-2-3-1 formation with Giroud leading the line while Antoine Griezmann, Dimitri Payet and Pogba starting in attacking roles while Kante and Matuidi to keep central midfield roles. Albania on the other hand will be will be without their captain Lorik Cana who was sent off for two yellow cards against Switzerland which means either of the two (Arlind Ajeti or Frederic Veseli) might get his place in the starting lineup. Match Predictions: France will be favorites going into the game but if Albania can produce a similar performance what they shown against Switzerland we might get a shock result here. France were not totally convincing against Romania other than moment of magic for Payet while Albania surprised a few people with their resilient display against Swiss. Key is not to concede early as far as Albania chances are concerned, if they can contain France till halftime after that pressure will build on the hosts leaving Albania chance of counter attacks. Having said that, France has too much quality to drop points in this game and I am going with another unconvincing victory for the french.